Professor David Ullman is among the world’s leading authorities on demonic literature, specializing in Milton’s Paradise Lost. Not that David is a believer—he sees what he teaches as a branch of the imagination and nothing more. So when the mysterious Thin Woman arrives at his office and invites him to travel to Venice and witness a “phenomenon,” David is hard-pressed to overcome his skepticism. But there are forces at work beyond anything David can imagine, and they will stop at nothing to ensure that the professor does not escape their grasp. Against his better judgment, David, accompanied by his beloved daughter, Tess, finds himself traveling to Venice, where an unspeakable horror awaits. Soon David is pulled into a journey that will redefine what he is willing to believe. Guided by symbols and riddles from the pages of Paradise Lost, David races to save his daughter. If he fails, he will lose Tess forever. Where the heck do I even start? Really?! My head is still buzzing after this wildly suspenseful ride! My tush was sitting on the edge of my seat the entire time while reading The Demonologist. It deserves every piece of praise it gets. I usually keep away from "Horror" books; Not because I get scared, but because they don't scare me. The usually fall flat. Well, that was not the case with this novel. Goosebumps, spine tingles, shivers, you name it, I got it. 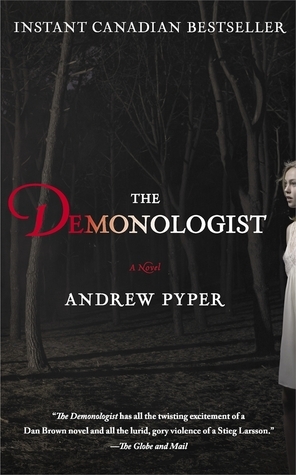 The Demonologist not only has the scare factor, but it had a very compelling and thought provoking storyline. Andrew Pyper had a great flow to his writing style as well. He doesn't fill the space with unnecessary details, or drone on about this and that. The fantastic plot lines flow consistently throughout the entire novel. The characters were the final piece to this hauntingly wonderful puzzle. David's emotions radiated off the pages. He was a bold character but he didn't lack vulnerability. He was okay to reveal weakness. And I absolutely adored Diane. She was spunky, smart, and hilarious. She added the light touch this book needed. Great review! I just finished reading Paradise Lost and now I'm very interested in reading this book as the plot is very intriguing.